By addressing market fit concerns and optimizing launch plans, SalesForce4Hire reduces business risk, improves the product sales cycle, and delivers solutions with speed, focus and precision. We examine your business structure and your product’s complexities in order to help differentiate your product and maximize value in today’s healthcare environment. Learn how our recommendations arrested revenue losses in 90 days and improved overall territory profitability. See Salesforce4Hire place 18,000+ units and create an average 60% annual growth within 4 years. Understand the economic impact of quickly understanding market viability and applying that knowledge in less than six months. Through years of experience in exploration and optimization of new markets, we have developed a proven market-penetration strategy that adapts to our unique client relationships. Developed and refined through years of proven success in medical device sales, our model produces field-tested sales and marketing solutions for Pre-Launch, Market Launch, and Post Launch phases of commercialization. Learn how our commercialization engagements accelerate revenue forecast and delivered a 16% sales increase. See SalesForce4Hire secure $50M investment and accelerate launch timeline. Understand the effects of an accelerated market channel entry that delivered an 80% conversion rate by six months. 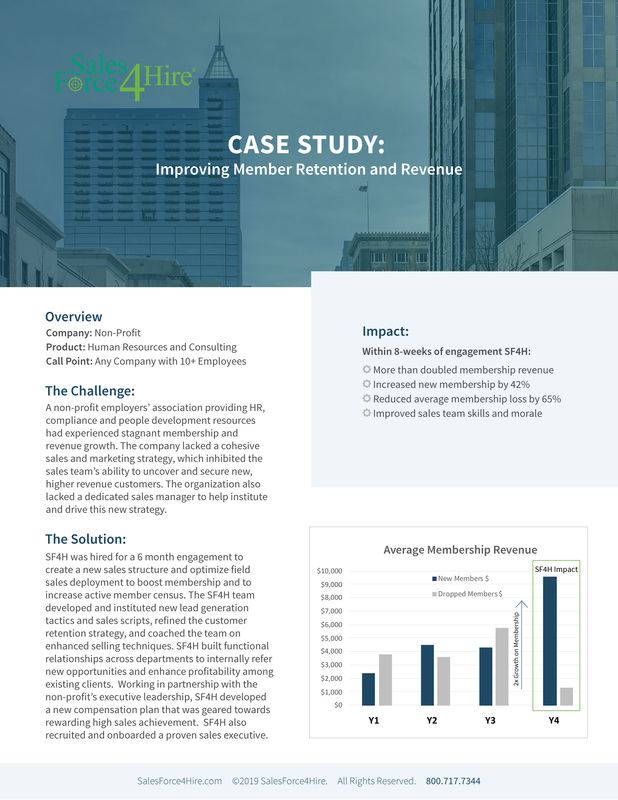 Learn how SalesForce4Hire doubled membership revenue within 8-weeks for a Human Resources and Consulting company. SalesForce4Hire’s recruiting solution delivers custom sales teams that are targeted, specialized and highly qualified. Our many years of expertise allows us to compress the time required to identify qualified individuals. We can then rapidly realign territory productivity via our unique screening and qualification process. Learn how SalesForce4Hire recruiting solutions ensured a highly qualified pilot territory team that was able to achieve a 25% higher total product usage compared to competing territory personnel.